I believe that most of you are quite familiar with hand grip strengtheners and to be honest, these little things can provide great benefits. Actually, everyone can use them. For examples, they are essential for those who usually practice a sport. Remember that things like weight training, fitness, martial arts, and basketball require great power in your hands. Therefore, in this article, I’ll show you how to choose the best hand grip strengthener for better performance. What Do Hand Grip Strengthener Do? As the name suggests, they can help us strengthen our grip and build forearm muscles. Specifically, by gripping something, you can develop your forearm muscles. That also means by simply closing and opening your hands, you can improve your hand grip strength and muscles’ appearance as well. Do you think that everyone buys a grip strengthener just to increase their grip for fun, don’t you? Absolutely not! In fact, there must be a reason behind that it. And in my experience, most people use grip strengthener to improve athletic performance in weight lifting, rock climbing, basketball and so many other sports. For example, in weight lifting, movements like rows and deadlifts require a strong hand grip if you want to lift heavy, and also a powerlifting belt to protect your spine​. The same goes for tennis, the strong your grip is, the longer and tighter you can hold the racket, right? So, if your deadlift session doesn’t usually end up well just because your grip is not strong enough, this is your solution. As mentioned above, by repeating the act of closing and opening your hands, you can not only improve your grip strength but also develop your forearm muscles. And this is especially important for guys who want bigger and more powerful forearms. Hey, you can do it by doing regular squeezing and gripping exercises or simply using a hand grip strengthener. Better dexterity equals better control over the fingers. Thus, it’s very important for everyone to know how much pressure to apply not only in training, but also in daily activities. This is especially true for typists, musicians and masseurs. This is because their jobs pretty much depend on the amount of pressure they apply. Using hand grip strengthener or doing any hand grip exercises can’t replace the cardiovascular exercises. However, they can help you reduce your blood pressure, therefore, minimizing the risk of a stroke or a cardiovascular disease. That’s the reason why you see a lot of old people who are likely to have heart disease use this item. Step 1: Place a handle against your palm and wrap the fingers around the other handle as comfortably as possible. Step 2: Use your forearm muscles to squeeze the handles as quickly as until the strengthener fully closes. Step 3: Hold that position for a few seconds, depending on your preferences, then slowly release the handles and repeat the intended amount of repetitions or until your grip get fatigued. Design is the first thing you should consider. Why? This is because different people have different palm structures. Therefore, it’s very important to choose one with a design that fits your palm so that you don’t feel uncomfortable using it on a daily basis. However, there is no way to make sure that has the right strengthener design without trying using it. However, we don’t always have that luxury, right? Therefore, it’s necessary for you to read the customer reviews of the product on the Internet. Besides, it’s quite weird but you should look at the picture of product thoroughly your eyes to imagine how it fits your palm. Material is also important because you don’t want to hold a strengthener that causes a lot of friction in your palm. There are different main materials you can find such as rubber, plastic, leather and even metal. Just try to find the right balance, still confused? Well, my advice is that if you are not tough, then it’s best to go for one made of plastic or rubber. If you are a weight lifter like me who is looking for something challenging, then a metal one is your best choice. Besides, don’t forget to read the customer reviews to make sure that the strengthen you are going to buy is durable. This will decide if you’ve bought an item only for several months or for years. For those who really want to improve grip strength, this is what they care most. So if you lift weights or want to improve your athletic performance, then this should be the most important criteria. Keep in mind that not every grip strengthener provides the same resistance level. Some items require very little effort to fully close it while others can take you months to move the handles. Therefore, it’s important to choose an item which is suitable for your current grip strength. In details, if it’s too easy or difficult for you, then it’s not worth the money because it’s totally useless. Instead, the best hand grip strengthener is one that is challenging enough and not impossible to use. For beginners or those with weak grip, just search for strengthener with media resistance levels. If you are a serious lifter or strong rock climber, then you should buy a product with a higher resistance. If you still don’t know for sure which resistance works best, then just literally get your fingers around one and test it out. Therefore, it’s necessary to go buy or test different strengthener in person. For those who don’t know what resistance level works best for you, an adjustable one may be a safe option. However, it depends on your purposes. This is because in general, adjustable models are not as durable and sturdy as fixed ones. So if you’re a not a person who is serious about working out or building a stronger grip, then choose an adjustable unit. However, if you are a serious lifter like me, then just go for the other. Last but not least, you should determine which style is the best for you. Actually, it all comes down to your personal preferences. However, entire-hand grip strengthener are the most common type on the market. Besides, for me, it’s not necessary to work your fingers individually. But if you are musicians, typists or who need to target individual fingers, then just go for the other style. The design of this grip strengthener makes it fit both small and large-sized hands. Thus, you don’t have to worry about this if your hands are quite bigger than others’. Additionally, it features non-slip handles, which are covered with soft rubber, providing you great comfort even when you used it for a long time. With the resistance range of 22 to 88 pounds, this one is suitable for everyone, including old people who have heart disease. It allows for lower-level workouts before you gradually move up to a higher resistance level. Therefore, if you’re looking something challenging to build a strong hand grip and forearms, then this one can be a good choice. 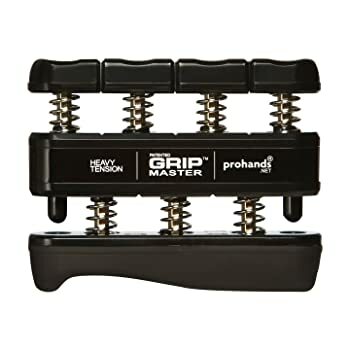 For those with wrist pain and hand issues, the adjustment dial makes this product one of the most common grip strengthener on the market. Another thing I like most about this product is that it’s very cheap. You know what? You just have to spend less than 10 bucks for this one. That’s the reason why if you are not really serious about working out, this can be your best bet. The downside of this one is that the product doesn’t open up enough to give my muscles a good stretch before I contract. The steel spring is not very durable as it can break overtime. 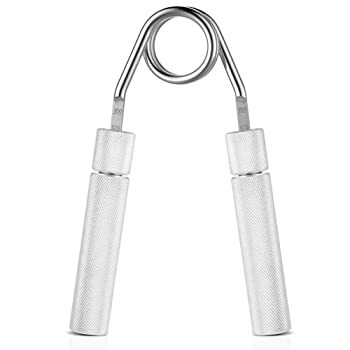 This is an individual-finger type so if you are worried about finger strength, then just go for this grip strengthener. This item can provide each finger the necessary attention so it’s a great device, especially for those who want to improve your dexterity. My dad recently had a stroke and he hadn’t regained full finger movement. Therefore, I decided to buy this one for him while he attended therapy. After a few weeks, he could work each of his fingers. Therefore, this can be an awesome gift you can give to someone you care about. For those who are looking for stress relief, this is not a bad idea. The drawback of this product is that it is not adjustable. There are only 3 different models for you to choose from such as: Blue-light (5lbs per finger), Red-medium (7lbs per finger), and Black-heavy (9lbs per finger). Hence, if you want to go heavier, you may have to buy another one. Furthermore, the resistance tension is not really great as the focus of this unit lies with the individual fingers. My first impression of this product is that it looks so sturdy and strong with a metal design. That’s why I believe it’s not a good choice for those who don’t really want to build a strong grip. Actually, there are 11 different resistance levels, from 60lbs to 365 lbs, so you can work your way up the ladder at different levels. Besides, the product is made of billet aluminum and alloy steel material which make it very durable compared to other rubber or plastic ones. If you are sure which resistance level to get, then I recommend you to go for the trainer (100lbs). To be honest, that level is not easy at all, trust me because after getting to 3 sets of 15 reps at that level, my forearms are totally exhausted. The downside of this one is that it’s quite heavy and not adjustable. That means when you’re done with a level, you have to buy another one to get to the next. However, as mentioned above, I prefer fixed models as they are more durable and sturdy than adjustable ones. For me, it’s fine to buy another one when you’re getting to a higher level. Additionally, if you don’t maintain properly, the coil is likely to be rusted overtime, especially at high humidity levels. As you guys can see, there are quite a lot of things to consider when choosing the best grip strengthener. However, I believe that if you know what you use it for, then it’s no longer a difficult task. All of the 3 items above are most commonly used products. 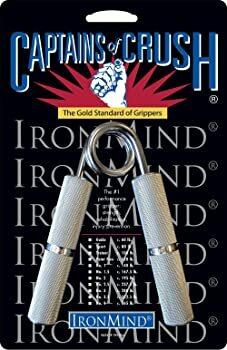 However, as for me, when it comes to fitness and weight lifting, the Captains of Crush Hand Gripper is the winner. It can help you build a stronger grip and bigger forearms much more effectively than the others.